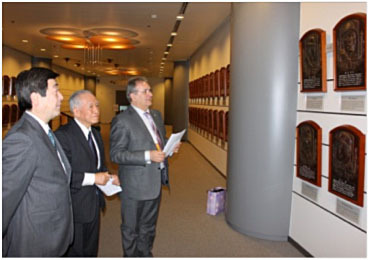 IBAF President Riccardo Fraccari visited the Baseball Hall of Fame and Museum of Japan together with Vice President Kazu Tawa. The Museum, the first of his kind in Japan, opened in 1959 next door to the historical 'Korakuen' stadium in Tokyo. When the Tokyo Dome opened in 1988, the Museum moved within the facility and doubled its space. The purpose of the Baseball Hall of Fame and Museum of Japan is to contribute to the development of baseball in the country through dedication of baseball greats (players, executives and umpires), who are the Hall of Famers, and the exhibition and collection of as many memorable baseball materials as possible, including baseball literature. President Fraccari is in Japan to attend the fund raising games of March 10, intended as a relief to the people hurt by 2011 earthquake and tsunami.